Birds of Wendell Marsh South, a slideshow and hike led by Steve Hale of Open Word Explorers, will be held on Thursday, August 30, in Sunapee. The presentation starts at 5:30 pm at the Abbott Library. A hike of Wendell Marsh South follows at 7:00 pm. The program sponsors are the Ausbon Sargent Land Preservation Trust and Abbott Library. For sign up information, visit Abbott Library. RSVP by August 28. The protection of the Wendell Marsh area in Sunapee has been a focus of the conservation efforts for many years. Earlier this summer (June 2018), the Ausbon Sargent Land Preservation Trust announced that 40 acres of undeveloped land, which includes a significant portion of the marsh habitat, had been preserved. NH Fish and Game began the conservation efforts in this area in the 1960’s. They protected the 10-acre Wendell Marsh Wildlife Area, identified as a high priority for conservation by the Town of Sunapee due to its pristine wetland habitat for waterfowl, wading birds, and other wildlife, as well as for water quality protection. Saving Special Places, New Hampshire’s annual land conservation conference will be held on Saturday, April 7, 2018, at Prospect Mountain High School in Alton. This year’s conference will offer 30 workshops. Topics will include conservation planning; farmland conservation; wildlife habitats and species; legal issues; “creative ways to connect,” and more. Additionally, the event provides networking opportunities with colleagues and practitioners in land conservation. For more information, go to savingspecialplaces.org. Check out this video THANK YOU, an inspiring look back at 2015 made possible by FOMS volunteers and friends. A hiker ascends the Andrew Brook Trail in Newbury. Courtesy photo. When the Society for the Protection of N.H. Forests (Forest Society) posted on Facebook a plan to buy a property in Newbury that hosts the trailhead of a hiking route to Lake Solitude on Mt. Sunapee, hikers who know the Andrew Brook Trail responded quickly. “Those posts told us we were working on a project that would make a lot of people very happy,” said Jane Difley, the Forest Society’s president/forester. There are three major hiking trails on Mt. Sunapee, but only one, the Summit Trail, is entirely within Mt. Sunapee State Park. The Andrew Brook Trail is one of two others that cross private land before entering permanently protected land in the state park. Access to the trailhead has been at the generosity of the landowner and could be denied by any future landowner. The Forest Society offered to buy the land, 33 acres off of Mountain Road in Newbury, when it came up for sale recently, and has a purchase-and-sales agreement with the landowner. First, however, the organization must raise $110,000 to cover the purchase, legal fees and future stewardship costs. 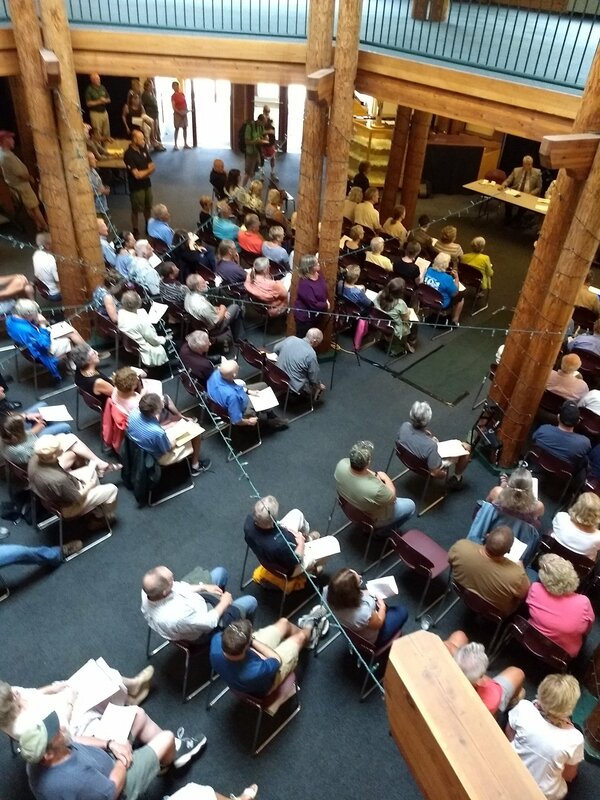 “We are reaching out to the hiking community and friends and neighbors in the Newbury area to ask for their support of our plan to protect the trailhead,” Difley said. The Andrew Brook Trail ascends along Andrew Brook and climbs through a beech, birch and maple forest for two miles before reaching Lake Solitude, a pristine pond surrounded by conifers. It then connects to the Sunapee Ragged Kearsarge Greenway’s 75-mile trail system and continues to the scenic cliffs of the White Ledges area and Mt. Sunapee’s summit. In 2006, the Forest Society led a campaign to purchase a conservation easement on 1,100 acres of land on the eastern slope of Mt. Sunapee. This easement protects the middle section of the Andrew Brook Trail and was a collaboration celebrated by partners including the Newbury Conservation Commission, Cardigan Highlanders Volunteer Trail Crew, the Monadnock-Sunapee Greenway, Friends of Mount Sunapee and the Sunapee-Ragged-Kearsarge Greenway. In 2010 the Goubert family of Sunapee donated 75 acres of land next to the 33-acre property the Forest Society now seeks to buy. Difley said the property’s value for hiking is the most obvious reason to protect it, but it also contains hardwood forest that protects water quality of Andrew Brook and several feeder streams, and it provides excellent wildlife habitat. She said the organization is seeking to raise the money necessary to complete the project by Jan. 20. More information about the project and how to donate, visit www.forestsociety.org. Overlooking Lake Solitude at Mt. Sunapee State Park. Photo credit: Jack Savage, courtesy of Forest Society. The Forest Society is seeking your help to permanently protect the trailhead of the Andrew Brook Trail, a favorite hiking trail to Lake Solitude and the White Ledges at Mt. Sunapee State Park. See Current Forest Society projects. “The owner of a 33-acre property that hosts the trailhead, off Newbury’s Mountain Road, has agreed to sell it to the Forest Society. Now we must raise the $110,000 needed to acquire the land, cover transaction costs, improve the trailhead and steward the property, and we hope you will give a donation to help,” the society release states. Map provided by the Forest Society. The Andrew Brook Trail is beloved by many hikers as a sweet ascent along a babbling brook that you rock hop across as you climb through a beech, birch and maple forest. It climbs for two miles before reaching Lake Solitude, a pristine pond surrounded by conifers. It then continues to the White Ledges area on the way to Mt. Sunapee’s summit. Additionally, conserving this parcel will help protect water quality of Andrew Brook and feeder streams in the area, provide high-quality wildlife habitat and enlarge the surrounding block of conserved land including the Andrew Brook Forest and Sunapee and Pillsbury state parks. For more information, contact Susanne Kibler-Hacker at the Forest Society, 603-224-9945, or via e-mail at skh@forestsociety.org.